Last week I talked about saving on energy costs by using the heat you already have. This week, I’m going to share some surprising ways to make your windows (and doors) a little more energy efficient. First you’ll need to identify drafty windows and doors in your home (you’d be surprised how many are). To do this, walk around with a candle on a windy day. In drafty areas, the flame will flicker. Please be careful around around the drapes! Turn “up” your blinds, creating a tighter seal to keep colder (or warmer) air out. Just as with door draft stoppers, placing rolled up towels on window sills can help keep out some draft. If you don’t want to use towels, you can get a door and window draft stopper for about $15. Over time, weather stripping begins to break down, leaving countless little cracks for air to enter your home. If you notice drafts near the doors, replace it. Believe it or not, the inside of walls can bring in unwanted cold air. Use caulk to seal up any cracks around windows, doors and even the baseboards. Easy-to-install plastic window kits can help to increase the efficiency of your windows by 90%. And for $3 per window, that’s a great trade off. Most are easy to apply and clear so it won’t look tacky either. Outlets can bring in cold drafts too. Use foam outlet and switch sealers to easily insulate them. Install stylish energy-efficient window coverings. These are bit pricey, but if your windows are very drafty, they could potentially pay for themselves. And they’ll work in the winter and summer. You can find very stylish thermal insulated blackout curtains on Amazon for about $55 a piece. If you have storm windows, use them. The additional pane provides a buffer against the colder air. If you don’t have storm windows, you’ll most likely need to hire a professional to install them. Cost will vary based on quality and location, but it’s a cheaper alternative to replacing windows completely. Don’t forget to cover the windows and caulk cracks in your basement. Use plastic or special attic covers to seal up entrances. You can get cheap reflective foil insulation for less than $20 or an attic pull down stair ladder cover for about $125. Hardwood floors also leak air, throw down some stylish rugs. SAFETY FIRST! Keep open flames away from anything flammable, enlist help whenever needed and never use anything on or near windows and doors that can’t be easily removed in the event of an emergency. Tune in next week to learn how to save energy in the kitchen. As always if you have any tips to share, please leave a comment. 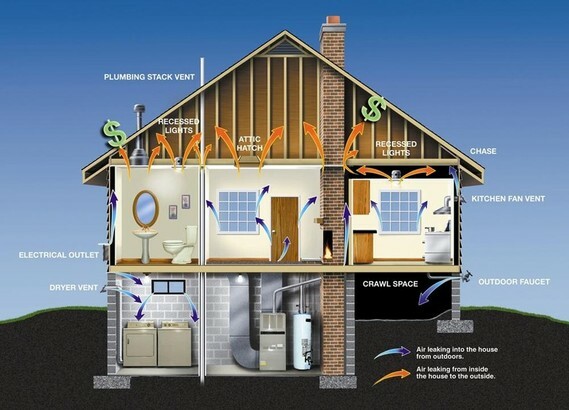 Be sure to check out previous posts for reader’s energy saving tips. Great tips. A lot cheaper than replacing your windows, that’s for sure! We always roll up our blinds (not to save energy) didn’t know this saved energy! Thankfully the place we are renting is a newer home, so there’s no worry about the window. Now, if anybody knows how to seal the fireplace somehow so that the hot air doesn’t go out the vent….let m know! Great ideas in this post.. I just bought a mobile home and it is in need of some of these suggestions.. I will definitely be taking your advice on these issues. Thank you for sharing the great tips. I feel it is extremely important to be energy efficient for the environment and because of the expense. Thanks for sharing these useful tips! Our old house was BAD about drafts. It makes a huge difference!